Born in Philadelphia, James Peller Malcolm (1767-1815) travelled to London in 1787, remaining there until his death. Initially hoping for a career as a landscape painter, he became well known for his engravings, which appeared in the Gentleman's Magazine from 1792, and for his books on history that made extensive use of original local records. First published in 1808, Anecdotes gives a typically personal and often light-hearted account of the history and customs of Malcolm's adopted city. Illustrated with his engravings, the work ranges from considering the diet and dress of the ancient Britons to suggesting that the Great Fire of London was state-sanctioned to rid the city of plague. This is the 1811 second edition of a valuable and often entertaining insight into English social history. 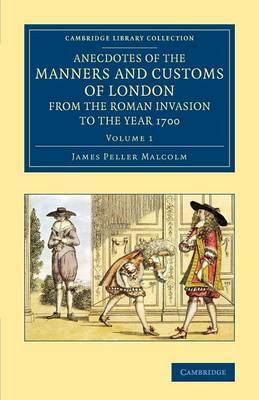 Volume 1, concerned with 'society', considers the lives of the earliest Britons, English diet over the ages, and the origins of English character and customs.